Northern Ireland’s Rory McIlroy says he feels more British than Irish and it now seems definite he will play under the British flag rather than the Irish tricolor in the next Olympics. Ever since it was announced that golf will be an official sport in the next Olympics, the discussion about which country McIlroy would represent has been a hot topic. Now he seems to have answered the question. McIlroy, born Catholic in Northern Ireland, told the Daily Mail at the weekend, “I’ve always felt more British than Irish. 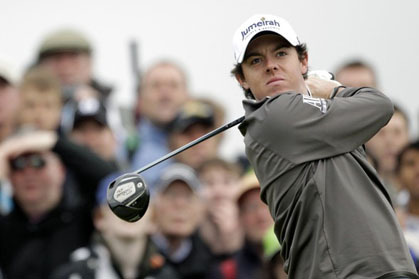 Catholic athletes in Northern Ireland usually declare for the Republic but McIlroyseems likely to declare for the UK. McIlroy says he definitely feels more British, ”And so I have to weigh that up against the fact that I’ve always played for Ireland and so it is tough. Whatever I do, I know my decision is going to upset some people but I just hope the vast majority will understand. McIlroysolidified his number one world standing with a weekend victory at the BMW championship, his third victory in four weeks. McIlroy had accepted a MBE from Queen Elizabeth at the end of last year, giving further credence to the belief that he would declare for Britain. As a Catholic reared in Northern Ireland, McIlroy has come under intense scrutiny for his political views. His grand-uncle was murdered in The Troubles by Loyalist paramilitaries but McIlroy has never discussed it. The murder was re-opened for investigation last year by the Northern Ireland cold case police authorities. McIlroy has avoided all political discussion. The only incident of note came when some nationalists claimed he brushed off an Irish tricolor that was thrown at him after his 2011 win at the US Open but the video is inconclusive to say the least. His compatriot and fellow golf major winner Graeme McDowell, who is a Protestant, gets no such scrutiny as it is widely accepted he will play with Britain. McIlroy also told the Daily Mail that staying No 1 was his priority and that his girlfriend tennis pro Caroline Wozniacki had shown him how hard it was to stay on top as her career has foundered. He also stated they had no immediate plans to marry.